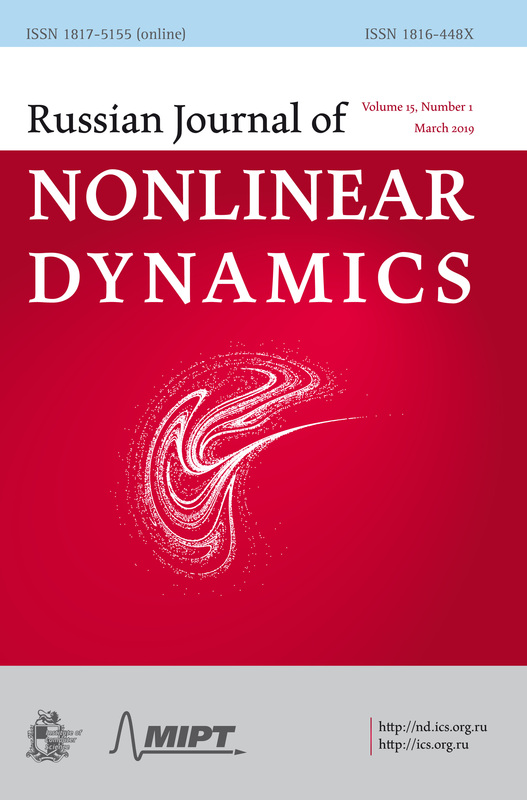 The special issue will emphasize the topics greatly influenced by S. A. Chaplygin which are also central subjects of Russian Journal of Nonlinear Dynamics. The deadline for submission of manuscripts is September 1, 2019. Publication of the issue is provisionally scheduled for Decemebr 2019. Zemlyanukhin A. I., Bochkarev A. V.
The FitzHugh – Rinzel model is considered, which differs from the famous FitzHugh – Nagumo model by the presence of an additional superslow dependent variable. Analytical properties of this model are studied. The original system of equations is transformed into a third-order nonlinear ordinary differential equation. It is shown that, in the general case, the equation does not pass the Painlevé test, and the general solution cannot be represented by Laurent series. Using the singular manifold method in terms of the Schwarzian derivative, an exact particular solution in the form of a kink is constructed, and restrictions on the coefficients of the equation necessary for the existence of such a solution are revealed. An asymptotic solution is obtained that shows good agreement with the numerical one. This solution can be used to verify the results in a numerical study of the FitzHugh – Rinzel model. The integrability of the FitzHugh – Rinzel model is considered. This model is an example of the system of equations having the expansion of the general solution in the Puiseux series with three arbitrary constants. It is shown that the FitzHugh – Rinzel model is not integrable in the general case, but there are two formal first integrals of the system of equations for its description. Exact solutions of the FitzHugh – Rinzel system of equations are given. Gumerov A. M., Ekomasov E. G., Kudryavtsev R. V., Fakhretdinov M. I. The generation and evolution of localized waves on an impurity in the scattering of a kink of the sine-Gordon equation are studied. It is shown that the problem can be considered as excitation of oscillations of a harmonic oscillator by a short external impulse. The external impulse is modeled by the scattering of a kink on an impurity. The influence of the modes of motion of a kink on the excitation energy of localized waves is numerically and analytically studied. The method of collective coordinate for the analytical study is used. The value of this energy is determined by the ratio of the impurity parameters and the initial kink velocity. It is shown that the dependence of the energy (and amplitude) of the generated localized waves on the initial kink velocity has only one maximum. This behavior is observed for the cases of point and extended impurities. Analytical expression for the amplitude of the localized wave in the case of point impurity is obtained. This allows controlling the excitation energy of localized waves using the initial kink velocity and impurity parameters. The study of the evolution of localized impurities under the action of an external force and damping has shown a good agreement with the nondissipative case. It is shown that small values of the external force have no significant effect on the oscillations of localized waves. An analytical expression for the logarithmic decrement of damping is obtained. This study may help to control the parameters of the excited waves in real physical systems. The known nonlinear integral model of a turbulent thermal is generalized to the case of the presence of the horizontal component of its motion relative to the surrounding medium (for example, the floating-up of a thermal in a shear flow). In addition, the possibility of the presence of a heat (buoyancy) source in a thermal is considered. In comparison with the author’s previous work, a solution is investigated for the case of unstable background stratification of the medium. The problem is solved in terms of quadratures. The asymptotics of the solution at large time intervals is analyzed. The solution describes, in particular, the nonlinear effect of the interaction of the horizontal and vertical components of the thermal motion, since each of the components affects the rate of entrainment of the surrounding medium, i. e., the growth rate of the thermal size and, hence, its mobility. The motion of a circular cylinder in a fluid in the presence of circulation and external periodic force and torque is studied. It is shown that for a suitable choice of the frequency of external action for motion in an ideal fluid the translational velocity components of the body undergo oscillations with increasing amplitude due to resonance. During motion in a viscous fluid no resonance arises. Explicit integration of the equations of motion has shown that the unbounded propulsion of the body in a viscous fluid is impossible in the absence of external torque. In the general case, the solution of the equations is represented in the form of a multiple series. Ryabov P. E., Sokolov S. V.
A completely Liouville integrable Hamiltonian system with two degrees of freedom describing the dynamics of two vortex filaments in a Bose – Einstein condensate enclosed in a cylindrical trap is considered. For the system of two vortices with identical intensities a bifurcation of three Liouville tori into one is detected. Such a bifurcation is found in the integrable case of Goryachev – Chaplygin – Sretensky in rigid body dynamics. We investigate a special case of vibrations of a loaded tire rolling at constant speed without slipping in the contact area. A previously proposed analytical model of a radial tire is considered. The surface of the tire is a flexible tread combined with elastic sidewalls. In the undeformed state, the sidewalls are represented by parts of two tori and consist of incompressible rubber described by the Mooney – Rivlin model. In the undeformed state, the tread is a circular cylinder. The tread is reinforced with inextensible cords. The tread deformations are considered taking into account the exact nonlinear conditions of inextensibility of reinforcing cords. Due to nonlinear geometric constraints in the deformed state, the tread retains its cylindrical shape, which is not circular for a typical configuration. The contact between the wheel and the ground plane occurs by a part of the tread. The previously obtained partial differential equation which describes the tire radial in-plane vibrations about the steady-state regime of rolling is investigated. Analyzing the discriminant of the quartic polynomial, which is the function of the frequency of the tenth degree and the function of the angular velocity of sixth degree, the rare case of two pairs of multiple roots is discovered. If the geometry of the tire and the internal tire pressure are known, then the angular velocity of rotation, the tire speed and the natural frequency, corresponding to this case, are determined analytically. The mode shape of vibration in the neighborhood of the singular point is determined analytically. Salatich A. A., Slavyanov S. Y. Different forms of the double confluent Heun equation are studied. A generalized Riemann scheme for these forms is given. An equivalent first-order system is introduced. This system can be regarded from the viewpoint of the monodromy property. A corresponding Painlevé equation is derived by means of the antiquantization procedure. It turns out to be a particular case of $P^3$. A general expression for any Painlevé equation is predicted. A particular case of the Teukolsky equation in the theory of black holes is examined. This case is related to the boundary between spherical and thyroidal geometries of a black hole. Difficulties for its antiquantization are shown. We consider Hamiltonian systems with $n$ degrees of freedom. Among the general methods of integration of Hamiltonian systems, the Poisson method is of particular importance. It allows one to find the additional (third) first integral of the Hamiltonian system by two known first integrals of the Hamiltonian system. In this paper, the Poisson method of building first integrals of Hamiltonian systems by integral manifolds and partial integrals is developed. Also, the generalization of the Poisson method for general ordinary differential systems is obtained. We give a supplement to the Smith reduction theorem for nonautonomous ordinary differential equations (ODEs) that satisfy the squeezing property in the case when the right-hand side is almost periodic in time. The reduction theorem states that some set of nice solutions (including the bounded ones) of a given nonautonomous ODE satisfying the squeezing property with respect to some quadratic form can be mapped one-to-one onto the set of solutions of a certain system in the space of lower dimensions (the dimensions depend on the spectrum of the quadratic form). Thus, some properties of bounded solutions to the original equation can be studied through this projected equation. The main result of the present paper is that the projected system is almost periodic provided that the original differential equation is almost periodic and the inclusion for frequency modules of their right-hand sides holds (however, the right-hand sides must be of a special type). From such an improvement we derive an extension of Cartwright’s result on the frequency spectrum of almost periodic solutions and obtain some theorems on the existence of almost periodic solutions based on low-dimensional analogs in dimensions 2 and 3. The latter results require an additional hypothesis about the positive uniformly Lyapunov stability and, since we are interested in nonlinear phenomena, our existence theorems cannot be directly applied. On the other hand, our results may be applicable to study the question of sensitive dependence on initial conditions in an almost periodic system with a strange nonchaotic attractor. We discuss how to apply this kind of results to the Chua system with an almost periodic perturbation. In such a system the appearance of regular almost periodic oscillations as well as strange nonchaotic and chaotic attractors is possible.